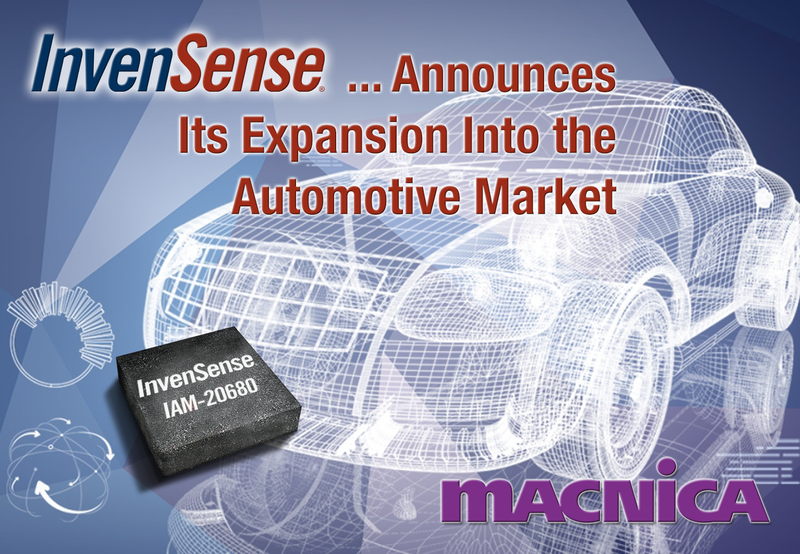 SAN Jose, California — Oct 28, 2015 — InvenSense, Inc. (NYSE:INVN), the leading provider of MEMS sensor platforms, today announced its offering and development of innovative sensor technology solutions for use in evolving safety and non-safety automotive applications. InvenSense's high-volume fabrication platform, high-performance MEMS-based motion tracking devices and microphones, algorithmic insights and advanced processor integration to propel innovative solutions and reduce time to market for novel and reliable sensor solutions. IAM-20680 high-performance, low-power, AEC-Q100-tested 6-axis gyroscope and accelerometer combo. This product provides customers the flexibility to mount the product in any orientation and in a small form factor, fitting any system size. In addition, the IAM-20680 offers best in class noise and offset stability, that meets the most demanding motion detection performance for a variety of in-cabin solutions, including navigation, lift gate motion detection and ADAS camera and image stabilization. InvenSense Positioning Library (IPL) for the automotive market, which improves standard vehicle navigation systems by providing continuous and accurate navigation in areas of poor GNSS signal quality. IPL combines inertial sensor data from the gyroscope and accelerometer with GNSS to provide always-available and more accurate location data. This capability is particularly effective when GNSS is inaccurate, such as in deep urban canyon environments, or in areas where GNSS is not available, such as tunnels or parking garages. "To reduce the typical design cycle time in the automotive market, InvenSense has forged a strategic alliance with a leading sensor and system integration partner for the development of sensor technology solutions for automotive, including in-cabin infotainment, as well as the evolving safety applications," said Behrooz Abdi, president and CEO of InvenSense. "This alliance leverages InvenSense technology and expertise in MEMS-based inertial sensors and microphones coupled with the partner's established automotive channels and in-depth insight into automotive development. This partnership has the potential to shorten time to market from 5 years to an expected 2 to 3 year span." "The automotive industry is approaching a tipping point of disruption, with innovations coming from companies outside the traditional automotive ecosystem, creating ever-increasing demand for novel sensor assisted systems," Abdi continued. "Through our innovative, consumer-oriented, high-performance sensors and software, in conjunction with our strategic partner, we will accelerate technology innovation and customer access to best-in-class new sensor solutions." "The barrier to entry in the automotive market is finally lowering, with strong demand for faster innovation and new sensors capabilities," said Jérémie Bouchaud, Director & Senior Principal Analyst, MEMS & Sensors for IHS. "To attain a higher level of performance and mounting flexibility and improved in-cabin convenience and automation, there is a shift in supply chain toward consumer electronics companies leveraging large volume scale and faster time to market. Although the majority of today's devices are still dedicated automotive components, especially in the harsh environments of brakes or injection systems, there are a number of significant examples of consumer device adoption even for safety applications. The automotive sector represents a meaningful portion of the MEMS market with 25 percent and $2.57B in value in 2015, while still offering reasonable volumes and more importantly, margins. This market remains healthy as a result of the mandates on key safety systems and government pressure to reduce emissions in engines." For additional information about the InvenSense sensor platforms, please visit www.invensense.com. InvenSense, Inc. (NYSE:INVN) is the world's leading provider of MEMS sensor platforms. The company's patented InvenSense Fabrication Platform and MotionFusion® technology address the emerging needs of many mass-market consumer applications via improved performance, accuracy, and intuitive motion-, gesture- and sound-based interfaces. InvenSense technology can be found in Mobile, Wearables, Smart Home, Industrial, and Automotive products. InvenSense is headquartered in San Jose, California and has offices in Boston, China, Taiwan, Korea, Japan, France, Canada, Slovakia and Italy. More information can be found at www.invensense.com or follow us on Twitter at @InvenSense. ©2015 InvenSense, Inc. All rights reserved. InvenSense, Sensing Everything, UltraPrint, FireFly, MotionTracking, MotionProcessing, MotionProcessor, MotionFusion, MotionApps, InvenSenseTV, DMP, AAR, and the InvenSense logo are trademarks of InvenSense, Inc. Other company and product names may be trademarks of the respective companies with which they are associated.